Tomorrow I drive to Serengeti. Finally. It’s been a long wait – I left Minnesota on December 28th and have been itching to get into the park ever since. As usual, nothing went as expected – mostly annual research clearance renewal obstacles – and so here I am, sitting in Arusha, the “Gateway to Serengeti” chomping at the bit to get inside. Running water. Hot, running water. Internet. Wi-fi internet! Reasonably fast wi-fi internet! …and other things that I’m sure I’m forgetting in the excitement of prepping for the field. To be fair, there are always a million and ten things to be done in town, and everything takes ten times longer to do than it does back home, so it’s not like I’ve just been sitting around Arusha languorously waiting to leave. Repairing the grass cutter (I cannot express how crucial this piece of equipment is), for example, takes five visits to various hardware stores, then an eventual half-day of trying to find some hole-in-the wall “engineering” shop on the outskirts of town armed only with an illegible but well-intentioned hand-drawn map provided by the last shopkeeper I’d visited. It’s always an adventure. Nonetheless, as nice as running water, restaurant food, and to-do-list-checking-off is, I’m excited to get to the park. I miss having elephants pop by the front yard during morning coffee, and the hyenas whooping uncomfortably closely while visiting the choo at night. 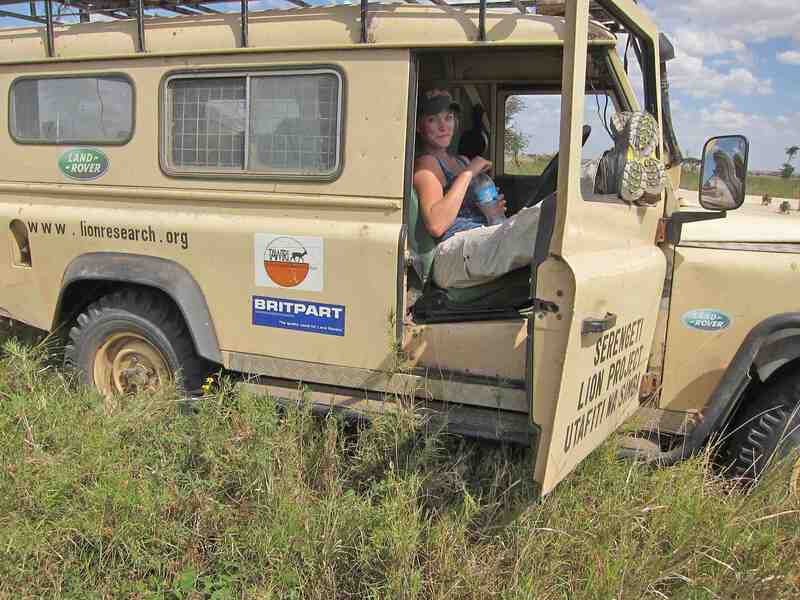 Alright, back to packing up my trusty Landrover (Arnold, below) — updates to come! You need to add common, bush, duiker Sylvicapra grimmia to your list as it clearly appeared in one of the images. I am a field biologist having operated in Africa most of my life and know this species well. We’ve come to realize that we are, in fact, missing a few species on our list that are rarely caught by the cameras. We built our list based on what we’d seen in camera traps in the first couple seasons, so if we didn’t see one then, it didn’t make our list. Do you by any chance have a link to your duiker? If you classified it recently, you can go to your profile at http://www.snapshotserengeti.org/#/profile and then click “Recents” (and click on the + at the bottom if you need to see more recently seen images). Then if you click on the duiker image and grab the URL, we can make sure it gets properly tagged. I’m going through withdrawals what am I suppose to do in the wee hours of the morning when I can’t sleep? Odd – a colleague alerted me to Snapshot Serengeti in November because he knew I was going there, and I spent all of Christmas with my entire family classifying. Now looking at the blog I realize that I was actually there at the same time as you, Ali. While I’m really just another tourist in the Serengeti and Ngorongoro, I still think it’s awesome that even though this was just another funky website to me in the beginning, I may even have bumped into you in Arusha and not even noticed. Who’d have thought? Looking forward to more pics and fingers crossed for the Grant!